The story is told about a group of college “mathletes” who were returning to their residence hall after an evening of intoxicated pleasure. Suddenly, their drunken leader noticed on the steeple of a church a large cross illuminated by the moon. “Ye mathematicians, look at God’s plus sign!” he yelled for all to hear. The group burst into spontaneous laughter. Not Another Drop! 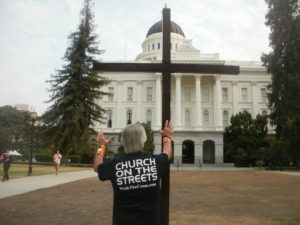 Keeping Kids Away From Gun Violence Is One Of Teen Scene’s And Walk The Cross’s Main Goals. Just like adults, young people “pack,” or carry, guns or other weapons for four primary reasons: PROTECTION, REVENGE, NOTORIETY, or CRIMINALITY. It can be very scary when a bully threatens to harm you. Getting even may seem to be the only way to save face. Carrying a gun to make others respect you might seem sensible to a youth who isn’t popular. Using a gun to commit a crime and obtain what you do not have might seem to be the only solution. But, are these really good reasons to carry a gun or other weapon? Is this what your parents really want you to do? Coming soon: daily “Good News” sermonettes on Jesus Christ. Check out the Dodge Dakota Sport truck recently donated to Cross Walk Bakersfield and Cross Walk California ministries. Because of this donation, Street Evangelist Tom Alexander will be able to take the large 10-foot, 60-pound cross to many California cities in 2009. Praise the Lord for a new go-ye-mobile and the opportunity to present the cross of Jesus Christ as God’s Plus Sign to men, women and children living in California cities and towns. Let the redeemed of the LORD say so, whom He has redeemed out of the hand of the enemy. I am a born-again Christian, a third day believer. This wasn’t always the case for me. Like the majority of religious and nonreligious people, I had no clue whatsoever that I was completely selfish and self-absorbed, The purpose of my life was to be the purpose of everyone else’s life. I was totally caught up in the “me, myself and I” syndrome. A Person Is A Person No Matter How Small: An Eight-Week Unborn Baby. In Dr. Seuss’ Horton Hears a Who (both the 1954 book and 2008 movie adaptation) and on the 15th of May in the Nool Jungle, Horton the elephant hears a small speck of dust talking to him. Turns out the speck is actually a tiny world and home to a city called Who-ville, which is inhabited by microscopic-sized inhabitants known as Whos.